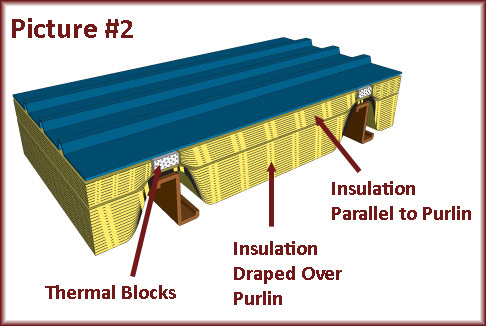 What is the Best Way to Insulate a Steel Building and Why It May Not Be Your Best Option? Steel buildings can be frustrating structures to maintain. While the skeleton of the building is made of incredibly durable material, the rest of the building is nothing more than metal on top of metal. Which means any type of temperature regulation within the building will almost seem like a wasted effort. The heat can run constantly in the winter, with air conditioning in the summer, and yet hardly a difference can be felt on the inside. In order to keep energy costs down, insulation is needed. The question is often asked, what is the best way to insulate a steel building? The best answer to this question is one specific method. Spray foam. Spray foam is the best because it can fill and cover cracks, corners, and other strangely shaped places through which air can pass in a building. By covering all of these locations, not allowing air to constantly sneak through cracks and nooks in the insulation, the effect of the insulation is significantly higher. But how reasonable is this option? Installing spray foam into your steel building can be extremely expensive. The cost estimates are shockingly steep, especially for those with smaller businesses purchasing pre-engineered steel buildings. Oftentimes, spray foam is too far out of the price range for many businesses. Many companies at this point give up, assuming there is no cost effective solution. CMI provides its customers with another option. CMI specializes in insulating new and existing pre-engineered steel buildings using fiberglass blanket. Through a variety of insulation options, CMI has created a wide range of methods that have been proven to be effective by its vast array of customers. Insulating your building will save you significantly on your energy bill, paying itself off in only a few short years as your building stays warmer in the winter months and remains cooler in the summer months. CMI knows that all companies have different budgets. While you may not be able to afford a spray foam insulation, you can afford the quality of CMI insulation. With low cost, high efficiency, and customer satisfaction on its side, using CMI is a decision you would not regret. Owning a business comes with many expenses. Owners and facility managers around the world are continually looking to cut operating costs in order to increase profits. Purchasing or leasing a building is a major expense that typically doesn’t allow for waste on utility expenses. With the help of insulation rebates, having an energy efficient building doesn’t always mean high up-front costs. Did you know you can save money on adding insulation to your building and taking measures to increase the building’s energy efficiency? Your local utility companies often have rebate programs available that will lessen the costs of adding insulation and other energy efficiency equipment. Local utilities companies such as Rocky Mountain Power and Questar can help you with the cost of various installations that improve the energy efficiency of the building envelope. 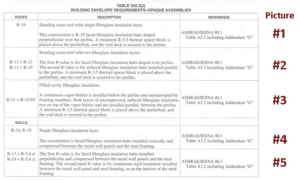 A building envelope is the separation of the indoor environment from the outdoor environment. It creates the buffer of insulation and other materials keeping the indoor environment heated and cooled when needed. 1. Learn more about available rebate programs. Rocky Mountain Wattsmart Business Program – This program is for new construction or major renovations and provides incentives that value between $0.05/square foot to $0.35/square foot depending on the type of equipment you are installing. Questar ThermWise Business Rebate – This rebate is for commercial roof/wall insulation. Roof insulation is around $0.16/square foot and wall insulation is near $0.12/square foot. 2. Make sure you fit within the guidelines of the program. Check all the terms and conditions of the rebate program. Check the dates of rebate to ensure you can apply for the rebate program. Rebates are only available within a certain number of days from your purchase. Be sure to check these deadlines to ensure you can qualify for your rebates. Within the terms and conditions are specific details for applying and set limitations. 3. Purchase qualifying products and save all your installation information. Some rebates require a pre-qualification of all equipment before a purchase is made. This helps you and the utility companies offering the rebate to ensure you purchase the right products so there are no setbacks in the application process. It also helps save time and money on the program process. The final step is to submit all applications by the set deadlines. Most utility companies require you to submit all paperwork within six months of the purchase date and within the promotion dates of the rebate offer. These steps can help you save time and money while working to improve the energy efficiency of your business. In 2005 congress passed into law the Energy Policy Act. Within this act, NEMA, the National Electrical Manufacturers Association, and NRDC, the Natural Resources Defense Council, backed a provision as part of the act to give tax credits to business owners who retrofitted or remodeled their business properties to be more energy efficient. This tax deduction was to offset costs incurred by business owners who spend monies on energy efficiency modifications to their buildings’ interior lighting, HVAC and hot water systems, and building envelope systems. Originally conceived to terminate few years later the benefits period of the tax deduction was extended in October 2008 to terminate December 31st, 2013. Ensure your building qualifies according to Standard 90.1-2001, Energy Standard for Buildings Except Low-Rise Residential Buildings – This may take some research and a little bit of leg work but you must know if your building qualifies before work begins. 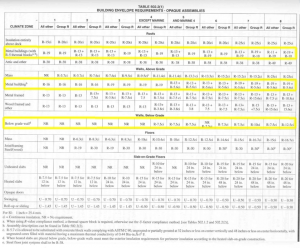 Build a plan to reduce energy usage by 50% according to the 2005 California Nonresidential Alternative Calculation Method Approval Manual – If you only retrofit according to a plan to reduce 10% energy usage, then none of your costs will qualify. Therefore you must create a plan with your local utilities company to reduce to 50% or more. They can help you draw up the possible upgrades to your building that will achieve this. Record and track expenses, materials, services performed by certified installers – If you don’t keep track of every receipt of all the work done it will have been in vain. You must have a record that the IRS can look through to verify your claim. Have an inspection performed – The inspectors must be certified engineers or contractors and licensed in the jurisdiction where your building resides. Any inspection done by unlicensed or uncertified persons will not qualify for the deduction. Claim the deduction on your 2013 tax refund – When you file your refund there is no specific place to claim this deduction so the IRS has directed that it be claimed under business forms in the “Other deductions” line. All your receipts and records must be included with your refund when claiming this deduction. After these steps you have already begun saving money on your utility bill each month and will simply need to wait for your refund check to be deposited in your bank account. If you’ve stumbled across this post, you are most likely looking for ways to conduct an energy audit on your metal or commercial building. Although hiring a professional to perform your energy audit is the best way to determine where your building is losing energy, you can conduct your own energy test that will help you start conserving energy right away. As you begin your audit, please remember to keep a list of areas you check as well as issues that need to be resolved. Once you have completed your audit you can prioritize areas that need to be addressed first. Even if your building is new there may still be areas that energy can be saved. Let’s get started! When doing the walk through of your building, make note of any air leaks (drafts). The potential energy saved just from reducing drafts can range from 5%-30% per year. Check for air leaks along baseboards; edge of flooring and at junctures of the walls and ceiling. Check areas inside and outside of your building, especially where two different materials meet. Although related to detecting air leaks in homes, the tips in this article also apply to commercial and metal buildings. Once you identify any air leaks, you will want to seal each and every one of them with the appropriate material. Plug and caulk around windows, doors, pipes, electric outlets and wiring. Large amounts of heat can be lost through ceilings and walls if insulation levels are less than the recommended minimum, this is especially true in metal buildings. If your company resides in an older building, the insulation standards may have been different at the time of construction then they are now, and may require added insulation to be up to the current standard. If your building has an attic check that it has been heavily insulated and properly weather-stripped. Seal any gaps that may be leading outside. When sealing areas near heat producing devices make sure to use non-combustible sealant. Check that there is a vapor barrier under the attic insulation; this will reduce the amounts of moisture that can pass through the ceiling. If a vapor barrier is missing, considering putting one in. This will prevent moisture from entering in which reduces the effectiveness of the insulation that could lead to structural damage. Next, check wall insulation, this may be a little more difficult. Select an exterior wall and make sure to shut off the circuit breaker or unscrew the fuse for any outlets in the wall. Test outlets to be sure electricity is not still running. Remove the cover plate from one of the outlets and gently probe into the wall with a small crochet hook. With the hood retrieve a small bit of insulation for easy identification. This method won’t tell you if the entire wall is insulated but will give you a good idea. The R-value of insulation varies based on what type of insulation you use and on the type of space that is being insulated. So make sure to consult with a metal building insulation expert! Heating and cooling equipment should be inspected annually. Filters should be checked and replaced when needed, generally every month or two, especially when being used regularly. A professional should be brought in once a year to do a thorough inspection. Every 15 years a unit should be replaced with a more energy efficient unit. Check ductwork for dirt streaks, which indicate air leaks. These types of leaks should be replaced with duct mastic. Any ducts or pipes that travel through unheated spaces need to be insulated with an R-Value of 6 as the recommended minimum. Approximately 10% of an electric bill is from energy used for lighting; this cost can be reduced by examining current light bulbs and replacing inefficient bulbs with higher efficiency bulbs. Some options for more efficient bulbs are: incandescent, compact fluorescent lamps or light emitting diodes. When shopping for bulbs, consider the brightness of the bulbs you want and look for lumens and the Lighting Facts label. Your electric utility may offer rebates or other incentives for purchasing energy-efficient lamps. After you wrap up your metal building energy audit, you’ll need to prioritize based on needs and budgets and start knocking out each area that needs improvement. If you happen to need additional insulation for your metal building, please contact one of our consultants by filling out the form located here. With ever growing expenses and energy use of companies, there a several ways to cut costs and save energy. Here is a list of seven things that will help your company with energy efficiency and saving money. 1. Taking your business outside: Plant trees around the outside of your building. In colder climates trees can act as a windbreak and in hot climates they provide natural cooling. Trees can reduce temperatures by 3-6 degrees. San Diego’s Office of Sustainability found that three well-placed trees can save up to 30 percent of a building’s cooling costs. 2. Power Down at Night: It may seem like a no brainer to power down computers at night but many people simply put their computer in sleep mode. Computers aren’t the only machines that can be powered down at night, copiers and printers can as well. This can save between $50 and $150 each year per device just by turning them off. 3. Circulate the air: Since most metal buildings have high ceilings, the bulk of the heat loss during the winter months occurs through the roof. Since there is typically a 2 degree increase in temperature per 1 foot increase in height, the temperature at the ground can be a cool 60 degrees with a ceiling temperature of 90 degrees! Even the best insulated roofs will lose significant amounts of heat if the warm air is not forced back down to the floor level. Paddle fans installed in the roof or other air exchange equipment can save many thousands of dollars per year in heating expenses. 4. Invest a little to save a lot: A simple change that may cost a little bit up front but pays off when your electricity bill comes. Replace incandescent light bulbs for compact fluorescent light bulbs. Compact fluorescent bulbs are 75% more efficient, which means you could save up to $200 for every 5 light bulbs changed.. Other areas where you can spend a little to get a big return; replace old windows with energy efficient windows, making sure your building is properly insulated, and add motion sensor lights in areas with low traffic, lights will come on only when needed. 5. Temperature Control: Install locking systems on thermostats allowing only certain individuals to set heating and cooling temperatures. During the summer setting thermostat up one degree will save 2-3% on cooling costs. Adjust thermostats during off hours, higher during cooling months and lower during heated months. 6. Add Insulation: There are some very cost effective ways to add insulation to a metal building. Our insulation retro-fit systems can drastically affect the comfort levels within the building year round, and significantly cut energy costs as well. 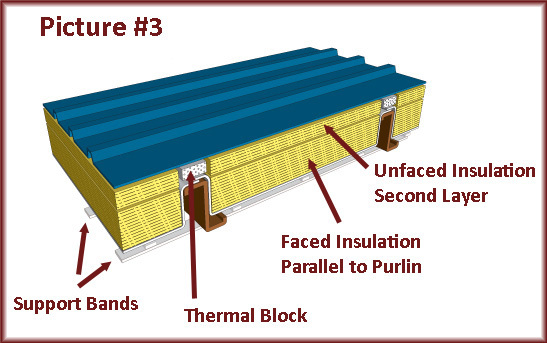 Adding insulation to an existing metal building is much easier than you may think! 7. Energy Assessment: An energy auditor can be called to inspect your business and see where money and energy are being lost. They will check for leaks, insulation, furnace, and ductwork and see where little fixes could be made to save money. So there you have it! Doesn’t sound like too much work to save a lot, does it? If you’re interested in looking at what it will take to add some insulation to your metal building, contact us by clicking here. The 2009 IECC energy code truly must be the first thing the U.S. Government has ever done that is hard to understand! No need to panic, most building inspectors don’t even understand the new code. Hopefully we can help you figure out what R-Value and insulation system you need to put in your building. If at the very least, this information will help you know the ‘lingo’ when you are meeting with your local building code officials. This blog is based on our experience thus far with the energy code and will cover the most essential points related to metal buildings and the 2009 IECC code as we understand it. Note: Understand that complying with the energy code involves more than just the building envelope and insulation package. 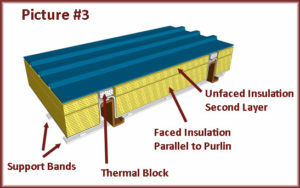 The three areas involved are: Building Thermal Envelope (insulation, openings for doors & windows, etc. ), Mechanical (heating, cooling), Power & Lighting. 1) Is your building conditioned / temperature controlled? 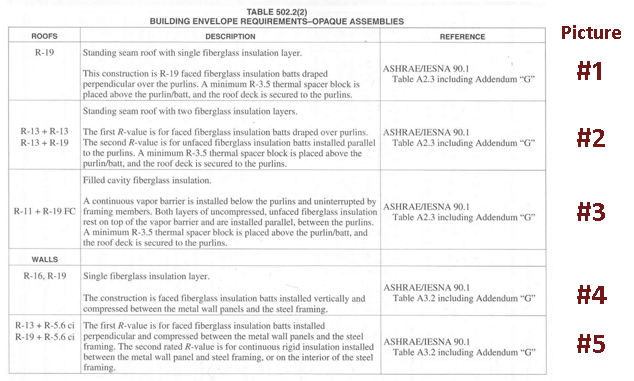 If the building space is temperature controlled, you will need to insulate according to the climate zones and tables below. IF THE BUILDING IS NOT TEMPERATURE CONTROLLED, THERE IS NO MINIMUM REQUIREMENT FOR INSULATION. Even though there is no minimum requirement, many people use a minimum of 2″ (R-8) -6″ (R-19) to control any potential condensation and provide more comfort during the heat of the summer and cold of the winter. 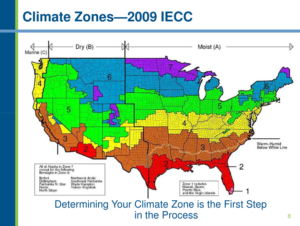 2) Find your climate zone: The map below shows the climate zones of the country in relation to the 2009 IECC energy code. 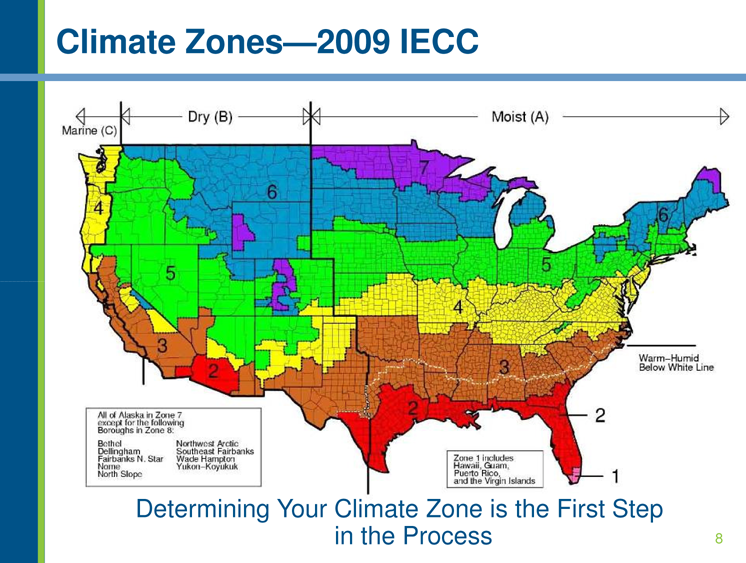 3) Now that you know your climate zone, find your climate zone on the table below. 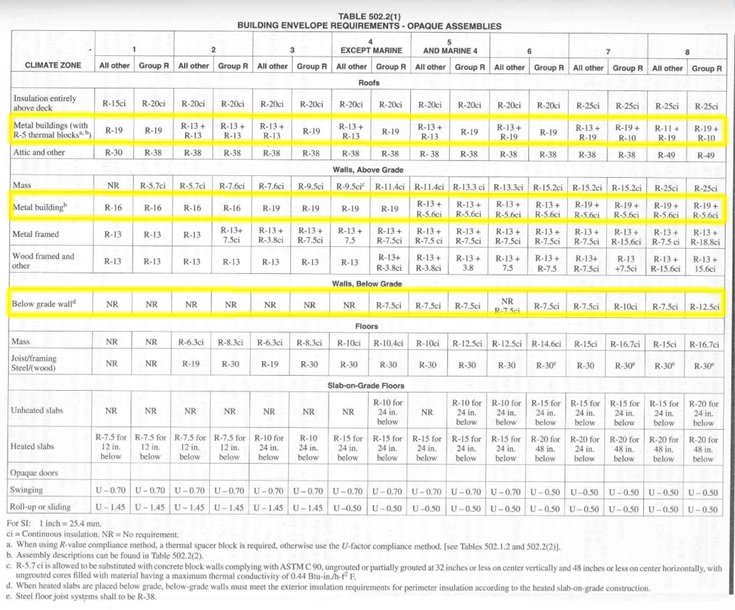 Under the climate zone number, you will find the required R-Values for your commercial metal building under the “All Other” column. Group R stands for residential dwellings. At this point you’ll see some R-Value combinations that don’t make much sense…. Don’t panic! Now look at step 4. 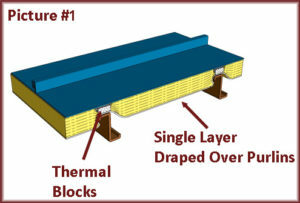 What kind of thermal block can be used on a standing seam roof? The best option here is an 25 psi extruded polystyrene board, or a 2 lb expanded polystyrene board. These are typically custom cut to 1″ x 3″ x 23″. What kind of thermal block can be used on wall gurts? 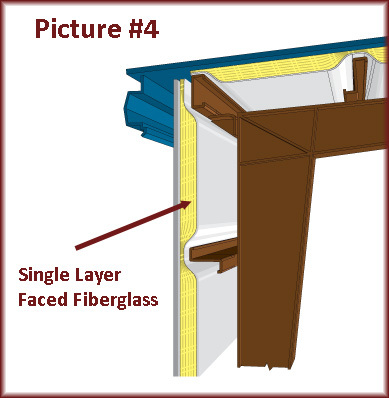 Since snow and wind loads aren’t as high on the walls, a standard rigid insulation board can be used as well as the Sealed n’ Safe Thermal Block System. 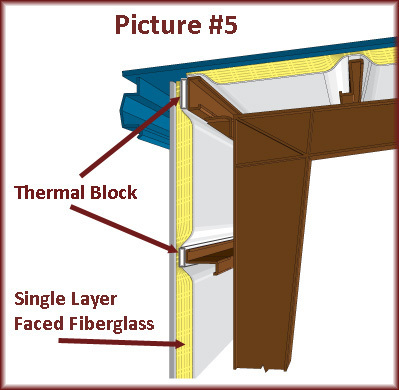 **Something to consider as you are putting together your building package is that whatever thermal block system you choose to go with, remember to order your trim and sheeting to accomodate the extra 1″ of material you are adding to the purlins and gurts. Also, make sure to communicate with your building manufacturer about the thermal blocks and how they will affect the engineering and warranty of the building.